In the battle of Yavin, the Empire wants to destroy a moon that is hidden behind the planet Yavin. They circle around the planet because the moon is hidden. Again: They are on a space station that can destroy planets! Planets! Like the one that is obstructing a clear shot on the rebel base (i.e. the moon). The only reason I see for them not to simply blow up Yavin is that it may take too long for the Death Star to be able to shoot again. So, is there any information on how long it would take? union forbade the Empire to unnecessarily expose them to radiation? 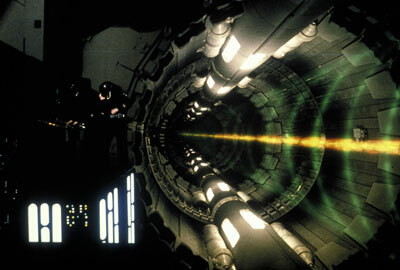 The Death Star's superlaser derived power directly from the hypermatter reactor. Its faceted amplification crystal combined the destructive power of eight separate tributary beams into one single blast with the intensity of a stellar core. After firing a blast, though, the Imperial engineers had to recharge the reactor, which took at least 24 standard hours. Though the energy output of this blast could be scaled to fire at smaller targets such as capital ships, as was the case during the Rebel assault on the second Death Star, the two major instances in which the superlaser was fired were at full power at planetary bodies. Now, I don't see exactly the source of the information, but most things on Wookiepedia derive from the rather extensive information in the Star Wars Extended Universe publications, which include tech specs and so forth. I'd take a guess that most of it came from the novel of the same name. They simply don't have the power. They do have the power but the station would be at risk in the aftermath. They do have the power but the recharge time after that shot would be longer than the orbital time to get in position to fire on their real target. Nor are we told what the cycle time is for the planet buster, but it can't be shorter than the time between Tarkin's ordering the destruction of Alderaan and the accomplishment of the same (around 15 seconds). The Death Star's superlaser cannon was once thought to be beyond the capability of Imperial military science. Its faceted amplification crystal combined and intensified eight separate initiator beams into a single laser with all the intensity of a stellar core; the impact of this beam could be controlled and scaled to suit the destruction of any target. A beam of one power level was used against enemy capital ships, while a much greater laser could cause the fracturing and disintegration of a target planet. The superlaser's power had to be recharged between firings and the intensity of each firing determined how many times per day the weapon could be used (from once per minute against spaceborne vessels to once per day against planetary targets). The pinpoint focus necessary for the combining of the superlaser's eight component beam lights limits its range to planetary distances. This new Death Star's central weapon, the terrifying superlaser, featured substantially increased power, allowing it to be recharged in a matter of minutes, rather than hours. The superlaser's targeting and power-control systems were refined so the weapon could be turned on capital starships. According the the Stardestroyer.net wiki, the first Death star took 6 hours to reload a planet killing shot, and the second took 5. It was on the official website, but some one took that down. Not the answer you're looking for? Browse other questions tagged star-wars technology a-new-hope or ask your own question. Why didn't the Empire target Yavin Prime? Why did Death Star need to orbit around Yavin for so long? Why couldn't the Death Star fire the superlaser through (the edge of) Yavin? How was the Death Star going to destroy the rebel moon in the Battle of Yavin? How did the rebels get hold of the Death Star technical specifications? Could the Death Star take out Coruscant? How long did the Rebellion study the Death Star plans? How long did it take the Millennium Falcon to get from Tatooine to the Death Star? How long did it actually take to construct the original Death Star? How well known were the events of the original “Star Wars” trilogy in the general galaxy? Or was it all about clandestine special operations missions? How does the Death Star gravity work?